Pinus resinosa.John Lynch.New England Wild Flower Society.gobotany.newenglandwild.org. (Accessed 8/2014). Pinus resinosa is an evergreen gymnosperm tree to 40 m tall, habit broadly pyramidal, bark light red-brown, shallowly fissured, with scaly plates. Leaves needle-like in 2’s, 9-16 cm long, snap cleanly when bent. Flowers: None. Gymnosperm. Male cones yellow, deciduous, clustered; female cones becoming 5-8 cm; scales about 2.5 cm; mature female cone stalkless (sessile), 4-8 cm, conic-ovoid. Habitat: Adapted to dry sandy or rocky soil, pH 4.5-6 (USDA, NRCS 2010). 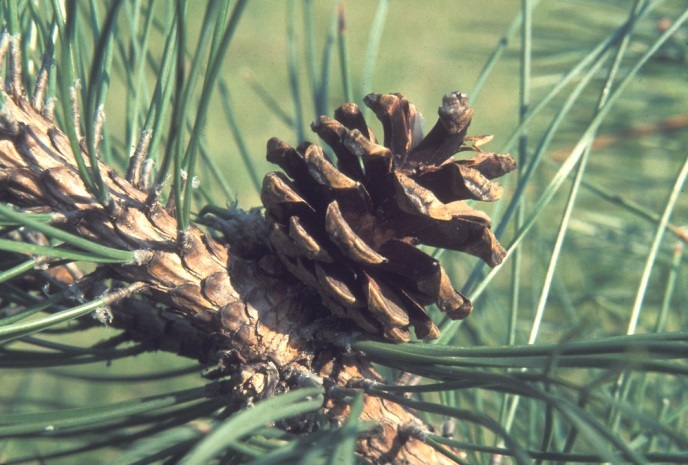 Notes: Cones preyed upon by Red pine cone moth and red pine coneworm, (Hauser 2008).